My husband and I have been married almost 27 years. For the last few months, we’ve been trying out Blue Apron, the refrigerated box that brings weekly meals and recipes to your door. 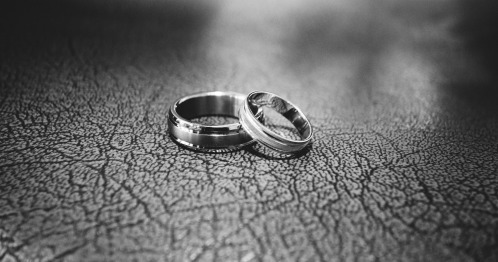 Three years ago, I wrote a post about what marriage is, and what it isn’t. *** It went wildly viral on The Huffington Post. But even before that, I’d given lots of thought to how a good marriage or long-term relationship changes you. What exactly is it that causes us to look forward to coming in the back door after a long day, and hearing your other half puttering around the kitchen? What do we get out of being partnered for many years? What keeps us from moving on to a newer model — something where we might be able to experience that lust/love of so long ago? Why do we keep our role in this particular play, and not yearn for a spicier part? Here are seven answers to those questions. 1) Watching someone else live their life, very differently than you, expands your very being. There is a widespread belief that dogs and their owners start to look like each other. So what happens when your companion is human? When you share your life for a long time with someone else, you begin to absorb some of their perceptions — not to where you necessarily adopt them yourself, but you can realize there’s a whole other way of looking at things. You may have to “agree to disagree,” but even the discussion changes you. You expand how you take in the world. 2) Seeing someone else falter, make mistakes or downright fail in such an intimate way leads to more compassion — for them, and for yourself. You watch him lose his job and become depressed. You watch her work way too hard, and burnout . You observe each other trying to parent — the toughest job of all. Perhaps you would’ve judged in the past, but you’re not as likely to anymore. You recognize with the years that no one is always successful — everyone will struggle. You’re still worth being loved. 3) You experience true trust. Feeling loved for all of who you are, warts and all, builds an immense level of trust. And loving someone, for all of who they are, knowing their vulnerabilities, is a tremendous gift. It’s not that we can’t see our partner’s weaknesses, but in a healthy partnership, we come to understand them, and love them anyway. 4) Having a daily touchstone lends a sense of security. Someone knows where you are, what you’re doing with your day. Even though it may be pseudo-security, or a false sense of control, it’s still helpful. None of us know what will happen in any given day. But knowing someone is keeping track of you feels good. Sadly, this is often the reason why people stay unhappily married. They’re scared to be by themselves. I’m not knocking this – being alone is hard. 5) Compromising helps you stay open and giving. If it’s acquiescence, it doesn’t work. If it’s martyrdom or dictatorship, it doesn’t either. But healthy compromise — not always getting things the way you want them — realizing what the other wants or needs is important as well — keeps you focused on others, not just yourself. Through the years, you both help each other experience what you want or can have from life. Compromising leads to gratitude and celebration. 6) You’ve lived with integrity. When I divorced the second time, I was afraid I didn’t “have what it took” to be married. Perhaps I was weak, or not able to sustain loyalty. Maybe I was a whiner, or selfish. There was a lot of shame. With time, the ache of failure has dissipated, and the acknowledgement that I have the capacity to get through hard times has been proven. That’s a really good feeling. Whatever kind of vow or promise you made, you’re keeping. You’ve lived with integrity. 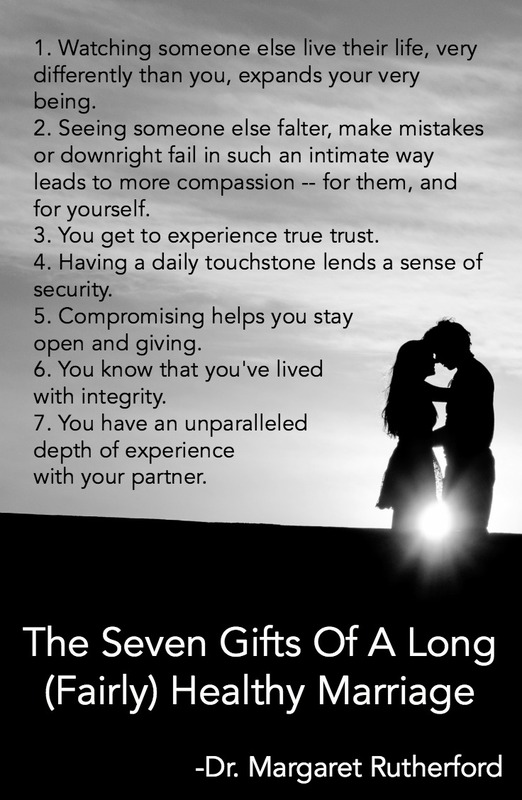 7) You have an unparalleled depth of experience with your partner. Long-term relationships have an innate complexity to them, not to be found in their newer counterparts. The threads between two people are woven in an intricate pattern of light and dark, shimmer and shade. Pull one thread, and the others shift in response. Sometimes, marriage is boring. You hear (and tell) the same stories over and over. You watch yourself and your partner getting older. You get irritated by the same things that have always irritated you, and will continue to irritate you. Hang in there. Wait until the play is over. There’s lots of good stuff that happens after the intermission. ***That post is now a beautiful little gift book available on Amazon for just under $10. Click here for “Marriage Is Not For Chickens,” and give the gift of honoring your own marriage, or the partnership of someone else you love. This post originally published on Midlife Boulevard.